The US’ pursuit of Edward Snowden, the whistle-blower who revealed information about the UK and US’ illegal mass surveillance programs, is by no means over, yet despite being unable to enter the country he appeared at CES this year via the medium of telepresence robot. Not too far away on the show floor is the US Army’s booth, making it about the closest US authorities have come to Edward Snowden since he fled to Moscow back in 2013. 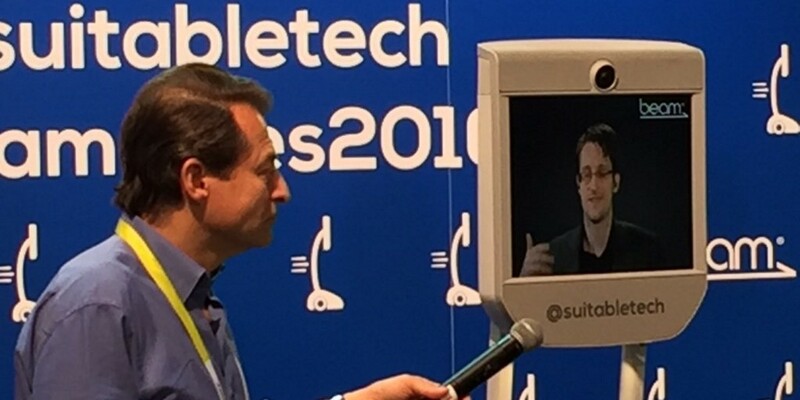 Snowden appeared courtesy of the Suitable Technologies’ telepresence robot called Beam. It’s essentially a tablet display on wheels that can be remotely controlled to allow the user to move around a space virtually. While most telepresence uses are suitably-boring in intent – think dreary remote meetings in offices, rather than bomb-disposal – they can also bring people with physical disabilities the ability to move around using only their minds. Wise words, Snowden, wise words. Perhaps that day will still come though.